This page will show some examples of the designs that are possible using our new Stealth Kitchen Module system. If you haven’t already read our brief overview of the concept, please Click Here. The following links lead to PDF files featuring 2-D CAD drawings. After opening a link, use your browser’s ‘Back’ tool on the tool bar to return to this page. Here is the Master Selection Sheet that shows the plans of the various Modules. Stealth Kitchens are formed by combining these Modules in various configurations. Links to samples of In-line, U-shaped and Peninsula Kitchens are featured below. 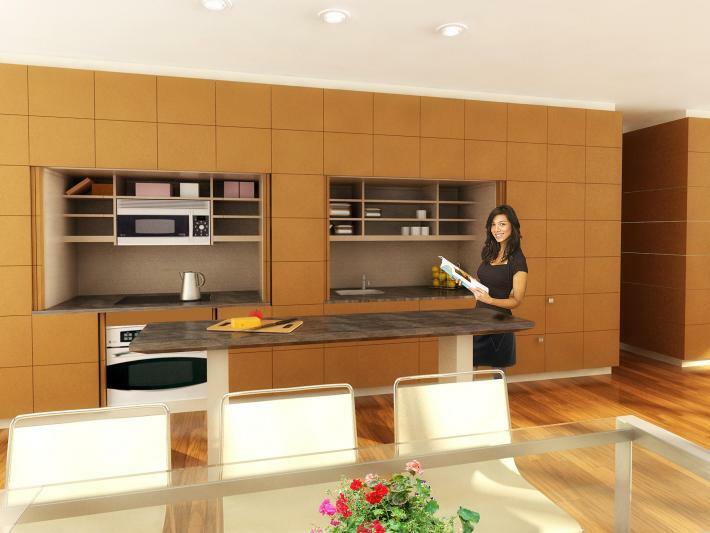 This link shows elevational views of a few In-Line kitchens using Stealth Kitchen Modules. When viewing these elevations, bear in mind that the spaces between the doors and drawers are only 1/8″ except at the countertop level where the space increases to 1/4″. This link shows how changing the door drawer and/or cornice style can affect the styling of a simple, 3 module kitchen. This link shows how the same styling examples just mentioned are used to style a Stealth Mini-Kitchen. This link shows plan views of a few In-Line kitchens using various combinations of Stealth Kitchen Modules that are perfect for use in a multi-purpose Living/Dining/Kitchen arrangement. This link shows plan views of a few U-Shape kitchens that features Sink or Cook top Workstations from our furniture line. This link shows plan views of a few Island kitchens that feature L-Shaped Modules coupled with Islands that can be YesterTec Workstations or any kind of custom design. This link goes to a Sample Selection Sheet of our 72″ Unit Kitchens. The UK72 and UK72-MK (master kitchen) completely hide a two burner ceramic cooktop, an Advantium convection/microwave/hood oven, a single dish drawer, a sink and countertop and lots of storage. The UK72-MK combines with an R module that conceals Subzero or Leibherr integrated refrigerator/freezers. All appliances only require 120V power. The standard specs for the modules include clear finished maple urea-formaldehyde free plywood interiors, 26″ deep dovetail drawers with full extension under-mounted drawer slides,28″ deep counter tops made of granite, solid surface, stainless steel, laminate, etc. The door and drawer faces include standard pre-designed solid wood, wood veneer and laminate selections but they can also be custom designed to meet a project’s design requirements. For ease of use, exposed pulls are necessary for the bi-fold pocket doors and refrigerator doors, but all other door and drawer pulls can be concealed (though for practical purposes, this is not recommended). Digital Graphics can be added to the door and drawer fronts to produce wall sized mural or Trompe L’oeil effects for the ultimate ‘Stealth’ kitchen. The Stealth Kitchen Module line may contribute to help a building qualify for Leeds Credits, depending upon how the modules are specified and used in the project. Design and Innovation: The biggest feature is the ability to save space in multi-task open floor plans by hiding the kitchen and allowing the design of the space to become smaller and uncompromised by a messy kitchen all the time. We can use urea-formaldehyde free plywood for the interiors and formaldehyde free MDF wood veneered sheets and MDF sheets which are used as a base for plastic laminate (ie Formica) for some of the door designs. Architects can spec the ‘Green’ brand and color of plastic laminates that they want to use. Most of the Hardwoods are harvested within 500 miles of our factory that is located in the northeast. Since our factory is not FSC, chain of custody certified, due to the fact that few FSC rated forests are actually in the USA, this attribute is more important (in our opinion). Renewable resources like Pine and Bamboo doors and drawer fronts can be specified.